82 MMS October 2017 mmsonline.com FEATURE securely, we are ready to start cutting metal. Or are we? One of the major causes of machining scrap is poor machine tool geometric performance, in both absolute terms and relative drift over time. Errors arise when the linear and rotary movement of the machine's axes fall outside the tolerances necessary to manufacture an accurate part. 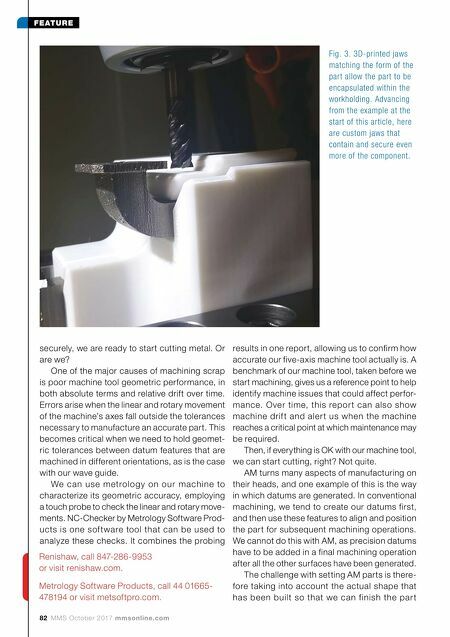 This becomes critical when we need to hold geomet- ric tolerances between datum features that are machined in different orientations, as is the case with our wave guide. We can use metrology on our machine to characterize its geometric accuracy, employing a touch probe to check the linear and rotary move- ments. NC-Checker by Metrology Software Prod- ucts is one sof tware tool that can be used to analyze these checks. It combines the probing results in one report, allowing us to confirm how accurate our five-axis machine tool actually is. 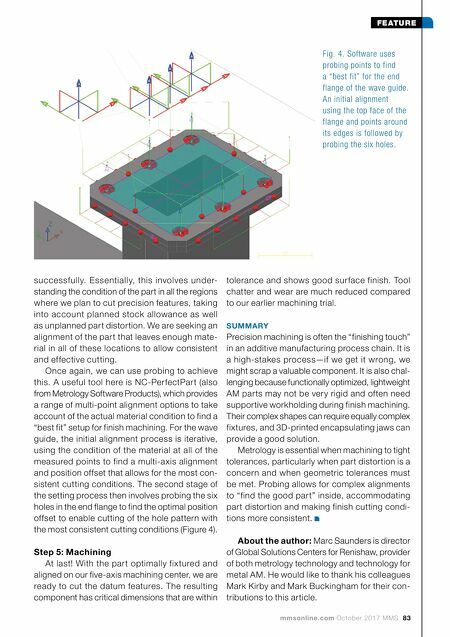 A benchmark of our machine tool, taken before we start machining, gives us a reference point to help identify machine issues that could affect perfor- mance. Over time, this repor t can also show machine drif t and aler t us when the machine reaches a critical point at which maintenance may be required. Then, if everything is OK with our machine tool, we can start cutting, right? Not quite. AM turns many aspects of manufacturing on their heads, and one example of this is the way in which datums are generated. In conventional machining, we tend to create our datums first, and then use these features to align and position the part for subsequent machining operations. We cannot do this with AM, as precision datums have to be added in a final machining operation after all the other surfaces have been generated. The challenge with setting AM parts is there- fore taking into account the actual shape that has been built so that we can finish the par t Fig. 3. 3D-printed jaws matching the form of the part allow the part to be encapsulated within the workholding. Advancing from the example at the start of this article, here are custom jaws that contain and secure even more of the component. Renishaw, call 847-286-9953 or visit renishaw.com. Metrology Software Products, call 44 01665- 478194 or visit metsoftpro.com.